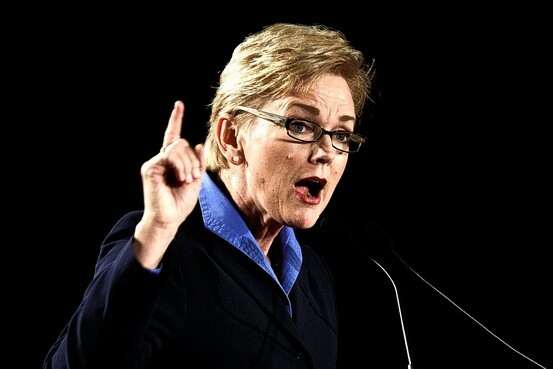 In his column today, Granholm’s Perfect Bad Example, William McGurn reviews former Michigan Governor Jennifer Granholm’s wretched 8 year track record. Some politicians give us failure. Some politicians give us failure mixed with spectacle. Once in a generation, a politician gives us failure and misunderstanding so colossal that his or her bad example rises to the level of public service. To this elite few belongs Jennifer Granholm. With this kind of record, most politicos might take refuge in prudence. Not Ms. Granholm. Today she is running around the nation selling a book and a message. The book is called "A Governor's Story: The Fight for Jobs and America's Economic Future." Her message—that Granholm's Michigan shows the way forward—has been taken seriously in all the places you might expect: the New York Times and Comedy Central's "The Daily Show." On her watch, the state's ranking in per capita GDP plummeted to 41st place from 24th, Detroit's population shriveled to its lowest level since 1910, and Michigan earned the dubious distinction of being the only state to suffer a net out-migration this past decade. I remind you that before Barack Obama, Jennifer Granholm was the new sparkly thing in the Democrats bling bag. She was frequently fawned over by the MSM as a Rock Star: young, photogenic, a law degree from a prestigious law school and impressive credentials (i.e. she was young, photogenic, had a prestigious law degree and was a member of the correct party). In fact there was more than a little consternation expressed that she would be ineligible to run for President after she had righted Michigan’s ship of state (which she was bound to do, because she was, well, young, photogenic…) because, having been born in Canada, she didn’t meet the Constitutional requirement of being a natural born citizen. That was back when those things were still important, and before Jennifer’s administration ushered Michigan into the dust bin of once great industrial states. As Mr. McGurn points out, Granholm herself, along with her husband are among the growing number of Michigan ex-pats, having relocated to Berkely to teach yet another generation the fallacious public policy of Keynesian economic intervention and government overreach as a solution to all social ills, particularly poverty. At the top of Ms. Granholm's claims is that she knows that low taxes and lean government are no prescription for growth because she tried supply-side and found it wanting. To prove her point, her appendix lists 99 business and 17 individual "tax cuts" she approved. She notes likewise that both state spending and the number of state employees dropped during her time. In fact, almost all Ms. Granholm's "tax cuts" are tax credits or other forms of tax preferences. A less delicate way of saying this is that far from reducing rates for everyone, Ms. Granholm played favorites. That meant a more complicated tax code where trendy businesses (green jobs, anyone?) that would fail without subsidies are effectively underwritten by non-favored businesses and other taxpayers. Nor does she mention - let alone hype - the fact that her tax record includes a $1.4 billion tax increase in business and personal taxes in 2007. Nor was there any mention of the tax increase she tried to foist on the backs of Michigan businesses and individuals on her way out the door in an effort to make the state coffers appear less depleted at the end of her tenure than they actually were. More contestable is her assertion that her industrial policy—throwing state and federal dollars at pet progressive industries such as advanced battery technology—is the answer. A year and a half before Americans learned about Solyndra, Gov. Granholm stood next to Flint businessman Richard Short at a press conference and declared that the $9.1 million in state tax credits that her government had awarded his renewable energy company would mean 765 jobs. The next day, Mr. Short was arrested. Turns out Ms. Granholm's people had not known that their champion of green jobs was a convicted felon out on parole. Two months ago he was sentenced to prison after pleading no contest to making fraudulent statements on his application for the energy credits. As the Michigan Mackinac Center points out, the Granholm state investment schemes in green energy program was a classic case of “a hamburger today on the if-come tomorrow.” In 2006, Gov. Granholm proudly stated: "In five years, you're going to be blown away by the strength and diversity of Michigan's transformed economy." Yeah, well we’re still waiting. The reason Michigan isn’t looking anything close to a rock solid Democratic state in 2012 is because Michigan residents, seeking a pleasant peninsula, looked around and have concluded that “if you liked Gov. Granholm's Michigan, you'll love President Obama's America,” and have decided to opt out next time around. I can tell you with authority, there’s precious little left in Michigan to like, let alone love. Jennifer isn’t very bright or shiny any more, and the state she left behind is growing downright ugly. But as liberals always do, she’s off to new climes now, denying that any of the state’s ills are due to her policies. If only we’d built more windmills…we could have watched Michigan go green even faster.